We are approaching Christmas, so I thought I should try to finish these off so far as my kid’s ages are. As a reminder, the following toys will be toys that are good for children around the age of 2.5 and older. Build on Favorites: You know the saying “Rome wasn’t built in a day”? That means that you don’t have to get everything immediately. If your child shows interest in train sets, you don’t have to go buy a huge, elaborate train set with all of the best trains immediately. You can build up over time. Add trains at various gift-giving times over the years. So review the categories you child loves and build on those. It might be doll house furniture, kitchen accessories, little people, trucks, doll furniture…build it over time. Train Sets : You might really want to give your 2 year old a train set…but it will likely be a few months before he can play with it without frustration. We gave Brayden his first train set at Christmas when he was 2.5. He did just fine with it. When Kaitlyn was two, she really started trying to play with Brayden and the train set, but she always got very frustrated. Her fine motor skills were not developed enough to play with it without pushing the trains off the track. Somewhere between 2-2.5, it became okay. We got Brayden the Thomas & Friends Wooden Railway – Water Tower Figure 8 Set . We prefer wooden sets. This set is a great value so far as Thomas stuff goes. However, we have since found lots of other wooden train sets that work just as well. 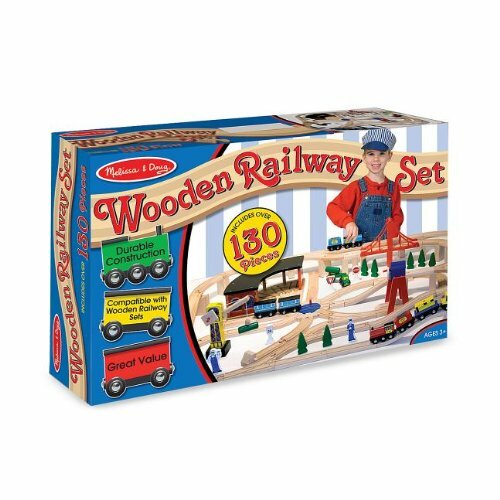 My favorite is the Melissa & Doug Deluxe Wooden Railway Set . Take note of the differences in what you get. For $27 more (right now…the Melissa & Doug one is normally 120, but on sale on Amazon for 65), you basically have a complete set with Melissa & Doug. Plus, that company replaces lost and broken pieces for free. They don’t look the exact same. When it comes to the tracks, it doesn’t matter at all. The main noticeable differences are in the accessories (the buildings and trains). You can always slowly add Thomas buildings if you want to and Thomas trains. Brayden and Kaitlyn have so much fun building train tracks all around the room. It really works their creativity. Board Games: This was the age Brayden was when I we got a whole bunch of board games for him. We did Let’s Go Fishing, Candyland, and Chutes and Ladders initially. Chutes and Ladders wasn’t a great one for a 2.5 year old. Not because of the skills required, but because the board is so chaotic! They need to be a little older to be able to keep track of where to go. We add at least one board game each Christmas (we love games). Hi Ho Cherrio is great. There are also fun games like Don’t Break the Ice, Don’t Spill the Beans, and Cooties. Board Games . See also the Best Toys: Board Games! post. Play Doh Sets : There are a lot of fun Play Doh sets available. Take note of your child’s fine motor abilities when choosing a set. Some of them can be very frustrating for the child (and therefore mom). We have the Play-Doh: Fun Factory Super Set . This has been a good set. It has simple tools you can let the younger child use, and more difficult tools to break out when your child is older. Blocks: There are lots of kinds of blocks. My kids have Melissa & Doug Deluxe 50-piece Wooden ABC/123 Blocks Set , which they have fun with. They will be getting the Melissa & Doug 100 Piece Wood Blocks Set for Christmas so they can build more things with it. DVDs: I like to get my kids a DVD for Christmas that is in line with their interest. Last year, Kaitlyn got Elmo. I am not sure what she will get this year, yet. Learning Activities: Kids love to learn. They love to be mentally challenged (as age appropriate). Getting them educational learning activities toys will be fun for them. See the blog label “learning” for more about these toys. CDs: I also like to get more music to add to our children’s music library. Books: Books are always great gifts. Choose a book that has a topic along the lines of your child’s interest. Also, look into prize winners and best sellers. There is a reason they are prize winners and best sellers. Kitchen Accessories : You can continue to build up your toy kitchen accessories. I have talked about dishes and food, now how about pot holders, wash clothes, aprons…Your 2.5 year old will do more and more imaginative play as she grows. Doctor Set : Along with the idea of dress up clothes, remember things like Doctor Sets. My two older kids love to play doctor. They like to pretend I am the patient (or each other) and check me out. This was one of my favorites when I was pregnant. I could lay on the floor and let them check me over, and we were having some play time together 🙂 These sets are also valuable for role playing if your child is afraid of the doctor. Sled : If you live where it snows, a Sled will be very fun. For more outdoor ideas for this age range, but summer types, see the 2 and up post, and the future 3 and up post. Ponies : One of Kaitlyn’s favorite things to play with right now is My Little Ponies . One of my favorite memories will long be coming home to find my dad (a very manly man) sitting on the floor playing ponies with Kaitlyn. Kaitlyn is very horse crazy and very imaginative. Ponies could be considered more of a figurine type of a toy, which is really better for older children. If your child is not into imaginative play, you might want to wait a bit longer before getting a pony. But you can always get one and see how it goes. Power Wheels : We love garage sales. One day, we really lucked out. We found a like-new power-wheel for $10. The battery didn’t work. My husband is fix-it guy, and just put a new battery in it. It has very much been worth that. It is a favorite toy. I highly recommend them. I would get a two seater so more than one child can ride at a time. They can be expensive. You might want to check classifieds (local, craigslist, ebay) or watch for a sale. Power Wheels . Puzzles : I can’t believe I forgot this in the original post. A few readers mentioned this. Kaitlyn recently got a new puzzle I wanted to point out because she just loves it. It is theMelissa & Doug Deluxe Latches Board . They also have a Melissa & Doug Deluxe Basic Skills Board that I like, but we have a doll that does the same thing so we don’t have it. Please share the toys your 2.5 year old loves/loved to play with! My (almost) 2.5 year old loves her tea set, puzzles and any kind of dress up item. She is getting a chest full of dress up (costume jewlery, old dance costumes, purses, etc) for Christmas! our daughter likes the fisher price little people town. and we give her other random figurines to put in the chairs and through the windows or doors. and we always name the people. thanks everyone! Especially about the puzzles! I can't believe I forgot to add that! I will add it to the post. Want to turn into a mini elf and play in this Ben and Holly store at figures and play sets. Everything is adorable and perfect and seemingly stimulates healthy positive creative play ((no plastic guns, sireny obnoxious beeping electronic things)). Beautiful and simple these toys can become cherished heirlooms.